By its very nature, a road affects the flow of water. 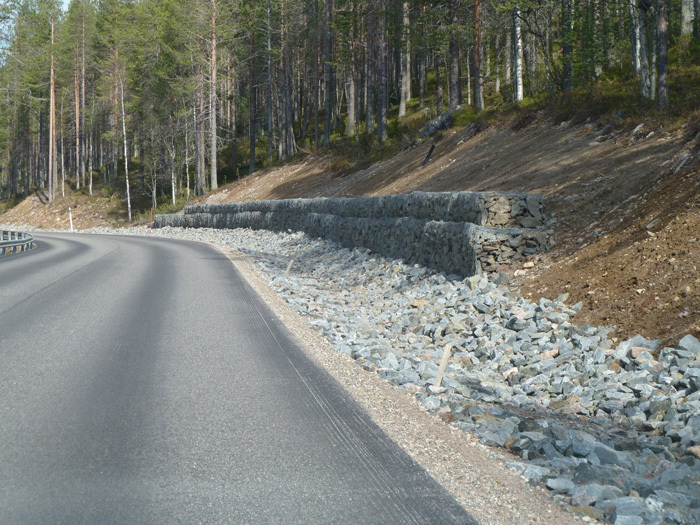 The road structure itself can act as a barrier, and designing and constructing drainage systems involves the need to dig ditches along the road as well as outlet ditches. In drier terrains (coarse grained glacial moraine, sand, etc. ), the impact of this on the environment will not normally be great, but the impact of new drainage on wetlands can be substantial. The natural flow and directions of water should always be taken into account when designing drainage systems. 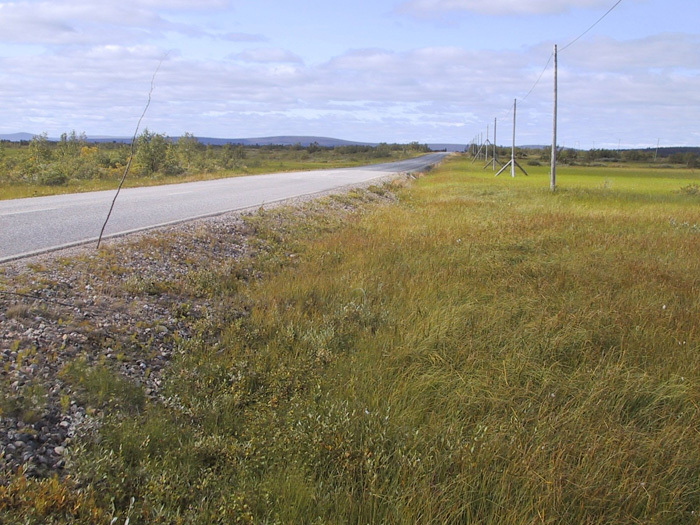 When designing a totally new road, land surveys should always be carried out to identify the most suitable alignment for the route. A good option to view the entire landscape is the use of aerial photos or modern airborne laser scanner mapping. When dealing with peatland the locations of the peat areas and depths of peat should also be determined. This information is needed for the environmental assessment but also assists in the preliminary geotechnical design. Recommended survey methods are ground penetrating technique and some test holes. Drainage arrangements may be challenging to carry out within environmental restrictions, but it is important that the final drainage of the road works! Roads can deteriorate very quickly if the drainage is not sufficient. The most critical part of a road drainage system are the outlet ditches. Missing or clogged culverts can also be problematic. The natural ecosystem can be susceptible to any changes in the case of roads built over wetlands. Usually these sensitive areas are peat bogs. The worse indicators of significant changes in wetland environments are dead and dying trees. 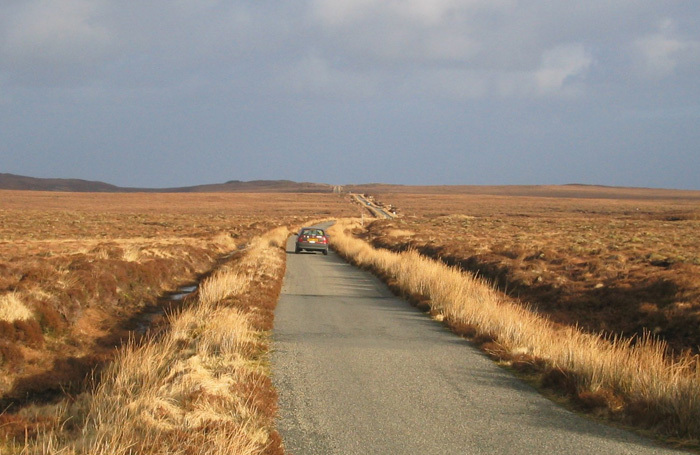 Roads on peat areas need careful consideration. Peat is an organic material that acts differently under road and traffic loadings. The ROADEX “Roads on Peat” eLearning lesson deals with the special characteristics of peat areas and what should be taken into account. When carrying out a reconstruction or rehabilitation of an existing road some surface water drainage and drainage structures are normally already present. This usually means that the primary impacts on the environment have already happened, and been accepted, and that only minor changes to the existing drainage systems are likely to be needed. These should usually be uncontroversial. It should be borne in mind however that when clearing ditches a certain amount of excavated soil will have to be disposed of, and priority should be given to reusing this soil wherever possible. 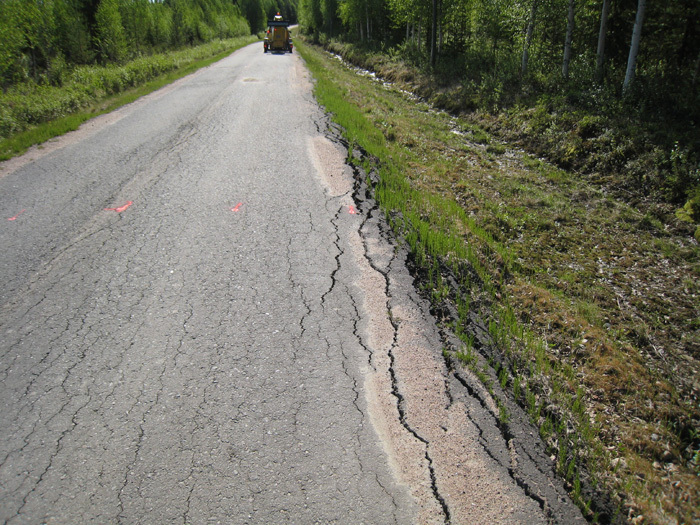 The soil excavated from the bottom of ditches is not normally usable for the road itself, but it can usually be used as landscaping measures in certain areas. Special care should be made to ensure that this soil does not flow back into the ditch. A secondary option is to transport the soil to a landfill site. In such cases it is important to ensure that the material does not end up in places where it could cause harm. It is reasonable to assume that there will be some pollutants in ditches, and it is therefore inadvisable to place the soil on land on which there is a large through-flow of water. Solid ground, such as glacial moraine areas, should therefore be selected as disposal places. 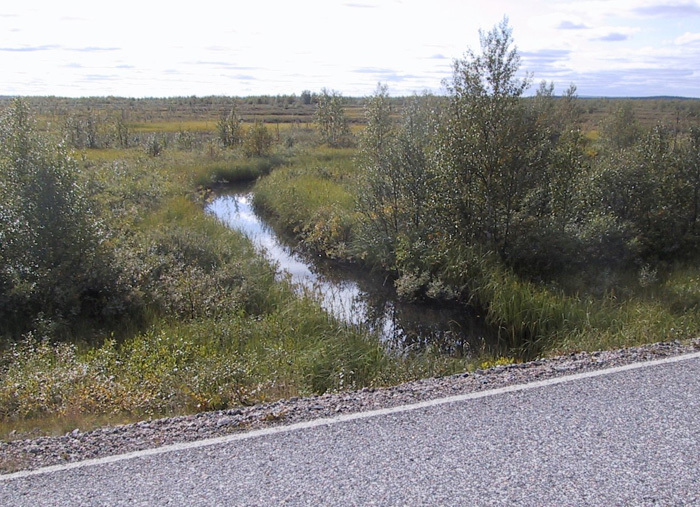 Drainage design can be challenging if the road runs for long distances in a cut or through peatland. Peat bogs are usually relatively flat, and water therefore remains in the area. An outlet drainage ditch may have to be fairly long to reach a suitable receiving watercourse and the machines used to excavate it may have an undesirable impact on the terrain. Generally there are limitations to the amount of work that may be done in protected wetlands. If possible, surface water should be drained along the road to existing watercourses to avoid damage to the hydrology of the wetland. 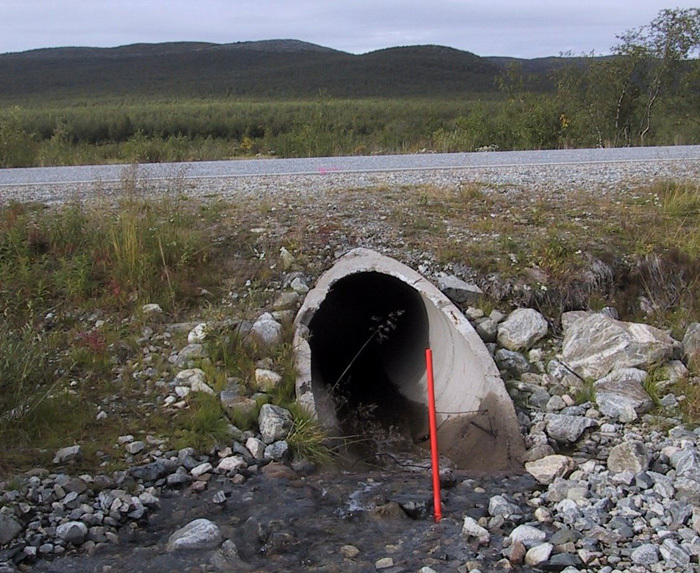 Culverts are necessary to facilitate water flow through a road. 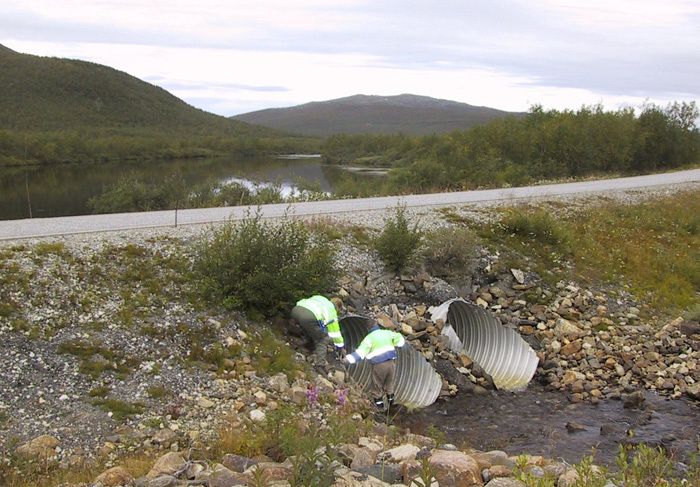 For obvious reasons they must be as wide as the water flow demands, but when designing new culverts or repairing existing ones it is also necessary to keep the environment in mind. Land animals can easily pass over a road, more or less, but fish, frogs etc. will have greater problems. The culverts cannot be like migration trap for water animals. If the culvert is a crossing for a stream, the depth of the water within the culvert must be sufficient for fish to be able to swim. It must also be ensured that the water in the culvert is level with the surface of the stream, and there should not be a “waterfall” at the end of the culvert. This should be the case for all culverts. Even though frogs can jump, the bottom of the culvert must be more or less in the same level as the bottom of the surrounding ditches. A silt trap should be constructed where the material in the ditches is silty. This is especially the case in new ditches where silty materials can be subject to erosion before being stabilised by vegetation. The erosion can cause clouding in the water downstream from the culvert. The main function of silt traps are to trap silt by slowing water flow, increasing staying time and give time for sedimentation of silt. A pit can also be provided at the intake side of the culvert to encourage the silty material can to be deposited there, with the result of less clouding and so on. All types of culverts can used in roadworks. Each should be installed in accordance with the manufacturer’s instructions. Culverts are usually constructed on “solid” ground and this can result in the rest of the road settling over time and the culvert sections being higher. This can be avoided by building transition wedges on each side of the culvert to minimise the change in road characteristics. In some cases (quite rare in practice) culverts can be used to “balance” areas of shallow surface water on each side of the road. Culverts should be spaced appropriately along the road to avoid a build-up of water on the high side of the road. If the spacing is too great water may pond against the road, indicating a need more frequent culverts. The stability of the inner and outer slopes of ditches should be included in environmental considerations. 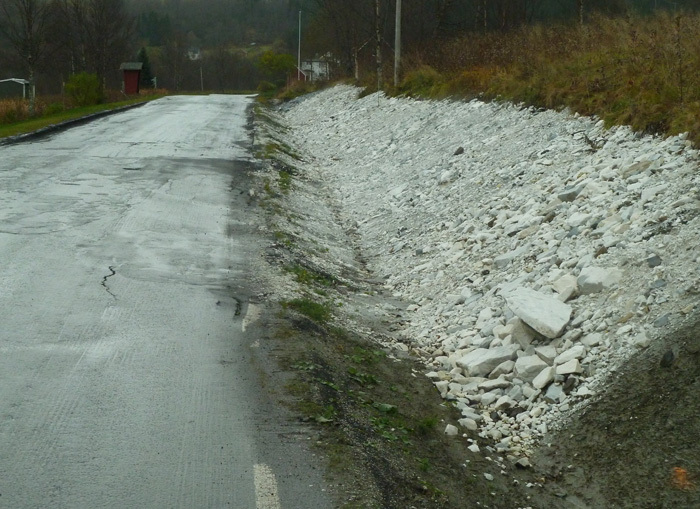 Slope stability is a very common problem in road cuts and slope erosion can be caused by surface water or groundwater. Materials from eroded slopes can flow into ditches and block the water flow. This in turn can cause the groundwater level to rise. The issue is worst where there is a fine graded sand and silt, and the groundwater flow is high. 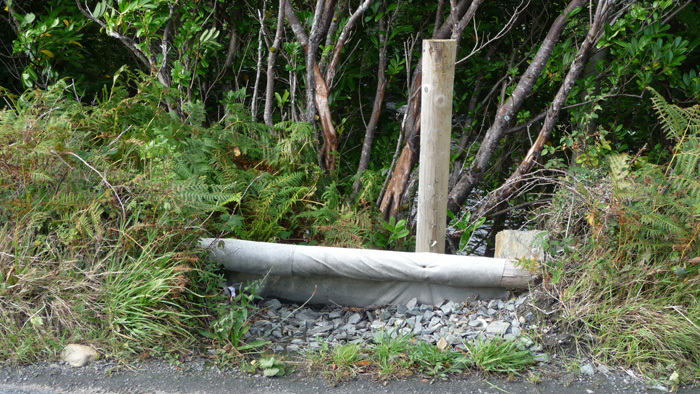 A good way to prevent erosion on slopes is to plant vegetation. 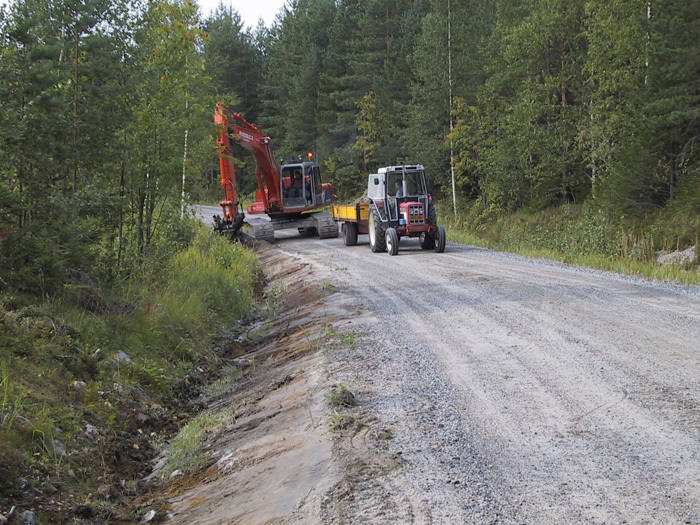 The ROADEX project has also proposed several technical solutions to increase the stability of slopes in roadworks. References, other than ROADEX information and publications used in this chapter, are presented after each chapter.